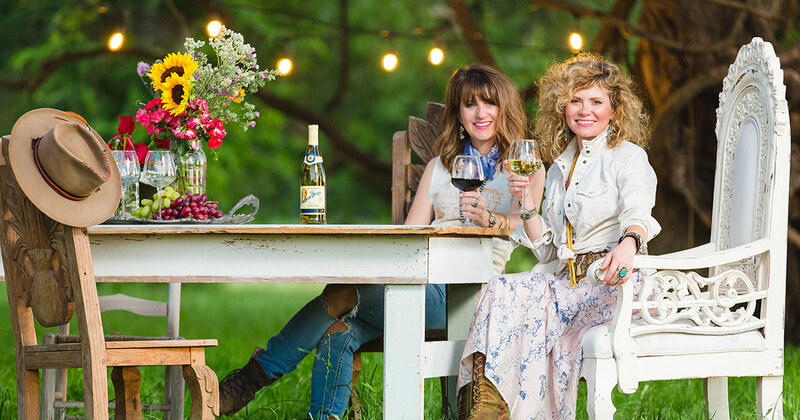 To Amie and Jolie Sikes, the sisters behind the Junk Gypsy Company, junking is a year-round endeavor in Round Top - and a way of life that almost didn’t happen. These days, the Junk Gypsy empire is nearly ubiquitous. From their world headquarters in Round Top, Amie and Jolie oversee a brand that includes not only their iconic boutique - a veritable temple of junk - but also a book, a wide range of eclectic merchandise, a show on HGTV, the rustic Wander Inn to host visitors to Round Top, partnerships with Pottery Barn, Virginia Dare Winery, countless DIY projects-in-progress, and more. 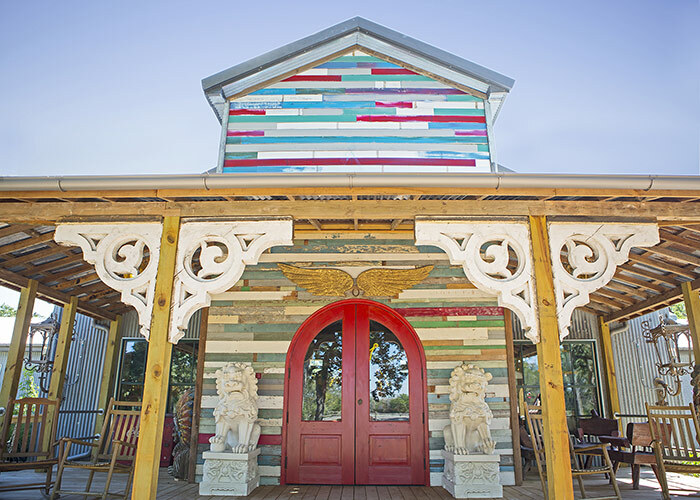 Junk Gypsy World Headquarters in Round Top, Texas. Back in the late 1990s, however, the Sikes sisters were far from the free-spirited, rebel-loving darlings of the junking world. Both women found themselves staring at the bland cubicle walls of their 9-to-5 corporate jobs, trying to find a way outside of the confines of a predictable career path that had seemed to be a good idea to both. 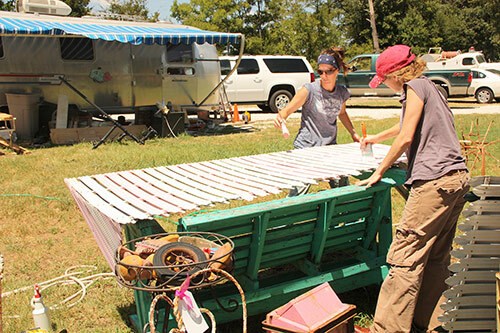 With $2,000, a pick-up truck, a stack of paper maps, and plenty of Willie Nelson on the radio, the Sikes sisters left the corporate world in the dust to pursue junking full time, never once looking back. Called the “Thelma and Louise of the design world,” Amie and Jolie have spiritedly infused everything they touch with their signature style, best described as rock and roll with a healthy dash of hillbilly. Thanks to a winding path no one could have predicted, the Sikes sisters have learned that as long as they follow their passion and never pass up good roadside junk, the rest will work itself out just fine. Q: You both went the traditional route of college followed by an office job, only to realize shortly thereafter that the corporate lifestyle was not for you. What was it about that world that was so mismatched for what you wanted for your careers/lives? A: After being raised by self-employed parents and working in the family restaurants our whole lives, I think it created a certain autonomy within us that we weren’t aware of at the time. A certain independence that we were used to. We were always encouraged to be creative, independent thinkers. The world of conference calls, corporate meetings, and of course, the rush hour traffic just wasn’t a good fit for either of us. We both gave it a few years, and then realized the country was calling our name. We weren’t sure what we were going to do, but we knew we needed to be working with our family again, we needed to be creative, and we needed to be in a small town. Q: Shortly after washing your hands of the corporate world, you took off in search of treasures. Where did the road take you in those early days? A: Anywhere and everywhere. There were no GPS in those days. Just paper maps scattered in the floorboards alongside business books, journals, and design books. We truly didn’t know where the road was leading but we had the freedom to let our free spirits be our guide. With Willie Nelson as our navigator, Jack Kerouac as our North Star and Thelma & Louise riding shotgun, we knew the sky was the limit. Q: How do you think growing up in Texas shaped your personalities and visions of a meaningful life? We passionately love Texas. We passionately love all things southern. The spirit of Texas is undeniable... Willie Nelson for example, from Abbott, Texas, learned early he had to stay true to his unique sound & style, even if his way was a little different. After trying his hand in Nashville where he cut his hair and changed his voice to conform to what was the common standard of that time, he soon returned to Texas and well, you know the rest of the story… independent & rebellious from the beginning. We are infinitely inspired by the independent style & the true grit of Texans. We were taught as kids that “girls can do anything boys can do better” and the importance of standing up for what you believe in. 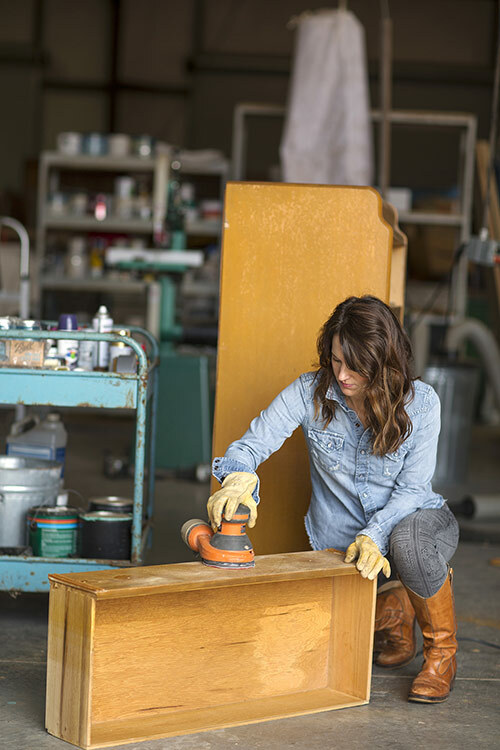 Q: Did you grow up in a home that was big on repurposing old things for new uses? A: Yes! We had no idea back then that this was something novel or unusual. Our mom always said, “waste not, want not” and consequently, NOTHING was wasted. We didn’t even leave food on our plates at the end of a meal. Everything was DIY’d (even though we didn’t call it that back then). Our restaurants were in old downtown buildings that we restored together as a family and were decorated with antiques and old signs which weren’t the hot commodity back then that they are now so we were able to collect them everywhere…. often in the trash. Even the kitchens were equipped with supplies and ovens and coolers we bought at auctions. NOTHING was new. Q: Where do you go to find the best junking? A: Hands down, the best junk is at Texas Antiques Week. The whole entire world comes right here twice a year, it’s a mad dash for a few weeks of scooping up the one-of-a-kind cast-offs and rusty, crusty junk from across the globe. Other than that, no roadside junk store is safe when we are on any type of road trip! Q: Do you know exactly what you’re going to do with each piece before you start haggling, or do you buy on instinct when you find a solid piece and then figure out the plan later? A: Instinct. Always instinct. And we don’t haggle much. We typically ask: “what’s your best price?” and then either take it or leave it. That’s the thing about junkers, there’s always more junk around the corner so we typically don’t have remorse over the one that got away. Q: These days, do you two still actually hit the road in your signature pink Suburban to sort through flea market finds, or has that been delegated out to your team? A: We definitely still hit the road for great junk. We call it dashboard therapy…no junk-finding team here! Unfortunately, old Marge isn’t as road worthy as she used to be, so we take our trucks which have plenty of bed space for all of our finds! Q: How would you sum up Junk Gypsy culture in one sentence? A: Independent. Grit. Spirit. Soul. Q: Did you ever dream that your wanderlust, passion, independence, and pluck would lead you down this path? A: Absolutely not and heck yes at the same time. This path is one that could have never been planned... in hindsight, we do feel like too much structure or too rigid of “plans” would have boxed Junk Gypsy’s trajectory and most likely impeded our journey. We never could have dreamed up some of the amazing adventures, partnerships, and experiences we’ve had. On the other hand, when we were in the early days, building the website in my spare bedroom, we had really, really big dreams. It really didn’t matter how pie-in-the-sky the dreams were, we believed we could make it happen. We believe you’re never too old to dream and to dream big…we’ll never stop chasing our dreams. Q: Do you have a road map for the future of Junk Gypsy or are you still taking it one turn at a time? A: One turn at a time. Q: Given that Francis Ford Coppola has made pursuing a passion a very successful endeavor, as have you both have, do you feel a kinship with him? A: We haven’t met Mr. Coppola, but from what we know about him, he is obviously passionate about everything telling a story. At the Francis Ford Coppola winery, we loved the fact that everything, even the bottles of crushed red pepper and hot sauce, had a story on the bottle; which is very similar to our world of junk. We love the stories that each piece of junk has to tell. It could be something as small as a gumball machine trinket or a vintage concert poster. It truly is why we LOVE old stuff…it’s for the love of junk, for the love of old. Old stuff has more soul and more character…new stuff has a story left to write, but it’s the old stuff that truly inspires us. We love to give things a story, almost like giving something it’s forever home, we give it a story. When we do a photoshoot, we immerse ourselves in the spirit of the shoot, we name the products in the genre of the shoot. We may be guilty of getting way too caught up in the details, but it’s what we love. It’s what inspires us. Q: Of all of the wines under the Coppola Family name, which do you think most embodies the Junk Gypsy spirit? A: What we love about the Coppola Wines is that they aren't just "wines", they are stories, they are history, they are magical and hold the promise of something grander than just another bottle of wine. All the antiques we've sold along the way have always the promise of a story and a previous life that created every dent, scratch and ding along the way, all of which add to the charm of the piece, and makes it completely different than buying something new and for us. That’s what makes every wine within the Coppola Winery exciting to us. We love the stories and the character attached to each wine . . .